A new study of ravens’ behavior when they think they’re being ‘spied on’ suggests they possess building blocks of humans’ own ability to interpret others’ thoughts, hopes, and fears. From ancient Greek mythology to Native American folklore, ravens tend to have the same role: the clever tricksters you don’t want to cross. Corvus corax and its relatives were even spies for Apollo, which didn’t end well for his unfaithful lover Coronis, and served as the eyes and ears of Norse god Odin. Ravens do spy on each other, it turns out, and they can infer when other birds are snooping on them. New findings, released Tuesday in a study inNature Communications, highlight just how sophisticated – and human-like – ravens’ cognitive abilities are. “What really is the feature that’s unique and special about human cognition?” asks co-author Cameron Buckner, a philosopher at the University of Houston. But ravens do have basic Theory of Mind, the authors suggest, after cracking one of the biggest puzzles in animal cognition debates: without speech, how can we tell what a bird is thinking? Ravens are willing to eat just about anything, but especially meat. After a group comes across some carrion, and has eaten as much as they can, birds will tuck remaining bits into their throat pouches, then scoot off to bury the scraps in hidden caches they can come back to later. It’s a competitive game of hide-and-seek, in which subordinates often spy to see where a dominant has stashed a future meal, and try to fly in for a taste as soon as the dominant takes off. Often, though, she knows they’re watching. Ravens use all kinds of tricks to throw off competitors: burying their cache as quickly as they can, for instance, or doing their digging behind a visual barrier; afterwards, they may avoid the spot, hoping not to draw attention to their buried loot. Some will even pretend to dig a hole while secretly keeping their snack in their throat pouch until they can find a more private spot. It all points to the idea that they know they’re being watched: that they can project other ravens’ motives. Better watch where he’s headed; I’ll dig up a bit as soon as he’s gone. Earlier studies with chimps, monkeys and ravens have also suggested a basic Theory of Mind, but with a major caveat: do the animals really know what others are thinking? Or are they just reacting to physical stimuli: visible raven plus a fresh food cache equals lost supper? “This was a really difficult problem to overcome,” Dr. Buckner says in a phone interview with The Christian Science Monitor. Mere cache-hiding might be “one-to-one stimulus responses,” ravens’ individual trial and error when they see another bird looking their way. To prove that a raven showed Theory of Mind, researchers needed to get the second raven out of the picture, to demonstrate that there was some underlying code helping ravens generalize about others’ motives. To test it out, they separated two experiment areas with a wall, which they fitted with a window and a small peephole, visible when the window was shut. Offering food to ravens in both rooms, with the windows first open, then closed, they observed baseline caching behavior: how did the birds try to disguise their caches when they could clearly see competitors, and when they couldn’t? The next time one of the remaining nine ravens entered the caching room, the window was still shut — but the peephole was open, and a loudspeaker on the other side played recordings of the ravens’ noises during the earlier caching stage. The birds couldn’t see the competition (and in fact there wasn’t any, just recorded noises) but, now acquainted with the peephole, they seemed to infer that someone could be watching. The birds hid their caches more quickly and delayed a return visit to the cache, similar to their behavior when they were visibly observed by other ravens. 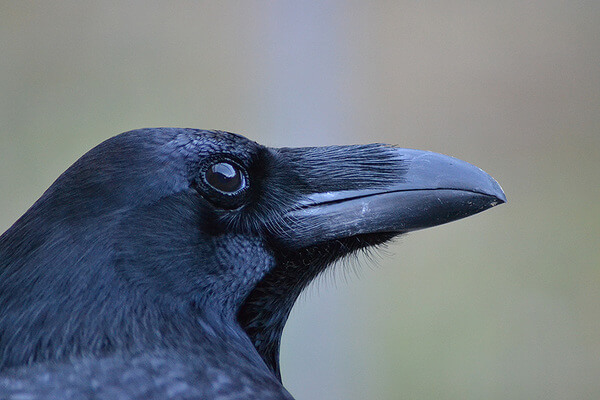 “Because all available behavior-reading cues have been controlled for in the test condition – there is no actual competitor whose gaze could be read, and the situation is novel from the subject’s perspective – these data provide clear evidence that raven social cognition cannot be reduced to behavior-reading,” the team writes. In other words, the birds met the researchers’ criteria for Theory of Mind by incorporating information from their own experiences with novel ones, to predict how others might act and how to adapt their own behavior appropriately. That’s not to say ravens are anywhere near on par with humans. One of Homo sapiens’ cleverest abilities is “false belief,” or our understanding that someone else may think something false is true, even when we know better. But it’s not there at birth: until around age 4, children have trouble grasping that their mind isn’t the same as everyone else’s. If a friend leaves the room, and someone moves a cookie in their absence, young children believe the friend will come back and know where it’s been moved. They know it themselves, so why doesn’t everybody? Eventually, though, almost all of us catch on. In adults, the chains of false belief can get far more complicated: I think that he thinks that she thinks that we’re throwing a party, for example. Language likely has something to do with that, though researchers heatedly debate the chicken-egg relationship of speech and advanced Theory of Mind. Some say Theory of Mind helped develop language: you point and say chien, I say dog, but we can both figure out what we mean. Others say language helps make Theory of Mind possible in the first place, helping us store seemingly dissonant ideas and motives in our heads at once. “We need to keep trying to fill in that story” about human development, says Buckner, and realizing that animals possess some of the precursors to our own Theory of Mind ability helps refine ideas about why we’re so exceptional. More practically, it also contributes to our understanding of children’s development, particularly cognitive disorders like autism. In our ability to intuit others’ thoughts and motives, humans are at the top of the game; now we need to figure out exactly why. Experiments like the raven story also point to the surprising things we share with other species: high-maintenance relationships, for one. Ravens require complex social cognition for their two very different phases of life, Buckner says: adolescence in a roving, hierarchical group of friends and frenemies not so different from human high school, and long-term breeding pairs.